If you're here, you've heard of Bitcoin. It has been one of the biggest frequent news headlines over the last year or so - as a get rich quick scheme, the end of finance, the birth of truly international currency, as the end of the world, or as a technology that has improved the world. In short, you could say Bitcoin is the first decentralised system of money used for online transactions, but it will probably be useful to dig a bit deeper. We all know, in general, what 'money' is and what it is used for. The most significant issue that witnessed in money use before Bitcoin relates to it being centralised and controlled by a single entity the centralised banking system. Bitcoin was invented in 2008/2009 by an unknown creator who goes by the pseudonym 'Satoshi Nakamoto' to bring decentralisation to money on a global scale. The idea is that the currency can be traded across international lines with no difficulty or fees, the checks and balances would be distributed across the entire globe (rather than just on the ledgers of private corporations or governments), and money would become more democratic and equally accessible to all. The concept of Bitcoin, and cryptocurrency in general, was started in 2009 by Satoshi, an unknown researcher. The reason for its invention was to solve the issue of centralisation in the use of money which relied on banks and computers, an issue that many computer scientists weren't happy with. Achieving decentralisation has been attempted since the late 90s without success, so when Satoshi published a paper in 2008 providing a solution, it was overwhelmingly welcomed. Today, Bitcoin has become a familiar currency for internet users and has given rise to thousands of 'altcoins' (non-Bitcoin cryptocurrencies). Bitcoin is made through a process called mining. Just like paper money is made through printing, and gold is mined from the ground, Bitcoin is created by 'mining'. Mining involves solving of complex mathematical problems regarding blocks using computers and adding them to a public ledger. When it began, a simple CPU (like that in your home computer) was all one needed to mine, however, the level of difficulty has increased significantly and now you will need specialised hardware, including high end Graphics Processing Unit (GPUs), to extract Bitcoin. First, you have to open an account with a trading platform and create a wallet; you can find some examples by searching Google for 'Bitcoin trading platform' - they generally have names involving 'coin', or 'market'. After joining one of these platforms, you click on the assets, and then click on crypto to choose your desired currencies. There are a lot of indicators on every platform that are quite important, and you should be sure to observe them before investing. While mining is the surest and, in a way, simplest way to earn Bitcoin, there is too much hustle involved, and the cost of electricity and specialised computer hardware makes it inaccessible to most of us. To avoid all this, make it easy for yourself, directly input the amount you want from your bank and click "buy', then sit back and watch as your investment increases according to the price change. This is called exchanging and takes place on many exchanges platforms available today, with the ability to trade between many different fiat currencies (USD, AUD, GBP, etc) and different crypto coins (Bitcoin, Ethereum, Litecoin, etc). If you are familiar with stocks, bonds, or Forex exchanges, then you will understand crypto-trading easily. There are Bitcoin brokers like e-social trading, FXTM markets.com, and many others that you can choose from. The platforms provide you with Bitcoin-fiat or fiat-Bitcoin currency pairs, example BTC-USD means trading Bitcoins for U.S. Dollars. Keep your eyes on the price changes to find the perfect pair according to price changes; the platforms provide price among other indicators to give you proper trading tips. There are also organisations set up to allow you to buy shares in companies that invest in Bitcoin - these companies do the back and forth trading, and you just invest in them, and wait for your monthly benefits. These companies simply pool digital money from different investors and invest on their behalf. As you can see, investing in Bitcoin demands that you have some basic knowledge of the currency, as explained above. As with all investments, it involves risk! The question of whether or not to invest depends entirely on the individual. 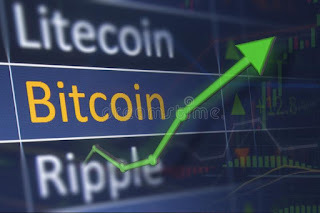 However, if I were to give advice, I would advise in favor of investing in Bitcoin with a reason that, Bitcoin keeps growing - although there has been one significant boom and bust period, it is highly likely that Cryptocurrencies as a whole will continue to increase in value over the next 10 years. Bitcoin is the biggest, and most well known, of all the current cryptocurrencies, so is a good place to start, and the safest bet, currently. Although volatile in the short term, I suspect you will find that Bitcoin trading is more profitable than most other ventures.